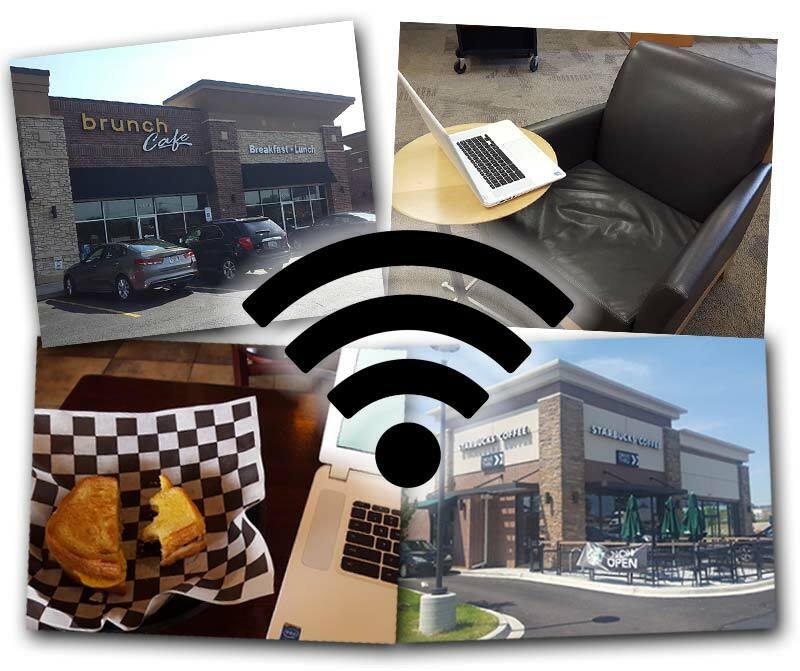 Since WiFi is a one of the main values we offer at The Day Offices (few people would work here without it), it’s natural to think about the OTHER places in the Bloomingdale vicinity where people can and DO go to get free WiFi. Free WiFi is not yet an unalienable right, or in other words, it’s not ubiquitously mobile yet. People are searching for ways to get online when travelling or even in the local communities where they live and work. According to Google’s Keyword Planner and other keyword tools I checked, over 100,000 people in US search for free WiFi and related terms each month in the US. So for those of you who live in the Bloomingdale area or if you are just passing through, here’s the somewhat complete and ever-expanding resource on “free” WiFi locations in the Bloomingdale-Roselle area. If I’m missing any locations or you disagree or have your own opinions on my reviews, please comment below. This post will be more useful if it’s not just my opinion! – and I’m expecting it to evolve over time. 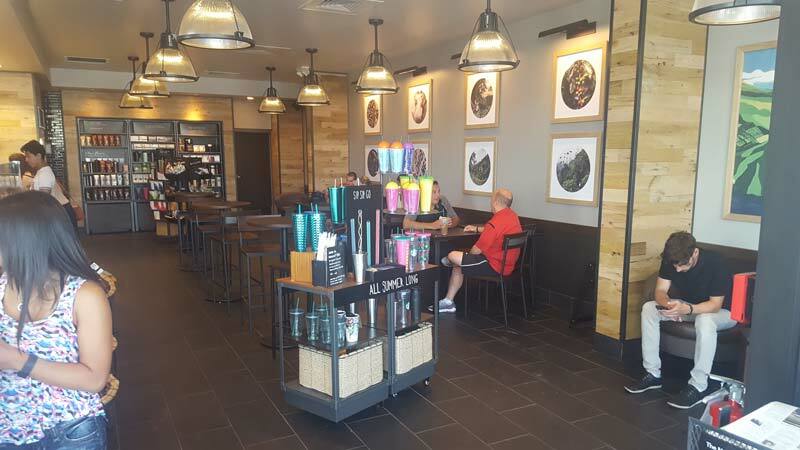 The word on the street is that Starbucks in Roselle is one of the busiest locations in the state. I can’t find any evidence to corroborate, but I believe it based on the number of cars and people I see moving through the tiny parking lot and building over the rush hour. It’s probably 70% drive-thru traffic, but the inside is still pretty busy at “caffeine hours.” I’m looking at a line of 10 people at the counter as I am sitting here typing this at 8:30am on a weekday morning. I’ve never had a problem finding a table to work at this location and I’ve probably sat here 30 times in the last 12 months. There are about 10 tables (mostly 2 seats), 2 bars with 3-4 chairs each, and a top secret (not really) lounge area with 2 leather arm chairs. There are 6-7 outside tables as well, but if you’re like me, you’re hesitant to work out there because you’re worried about the next time a car drives through a Starbucks storefront! The tables at this location do have wireless charging which has helped me out in a pinch when I was out of juice and without my phone cord. Speed is good here as is the case at most Starbucks locations thanks to upgrades to Google WiFi. 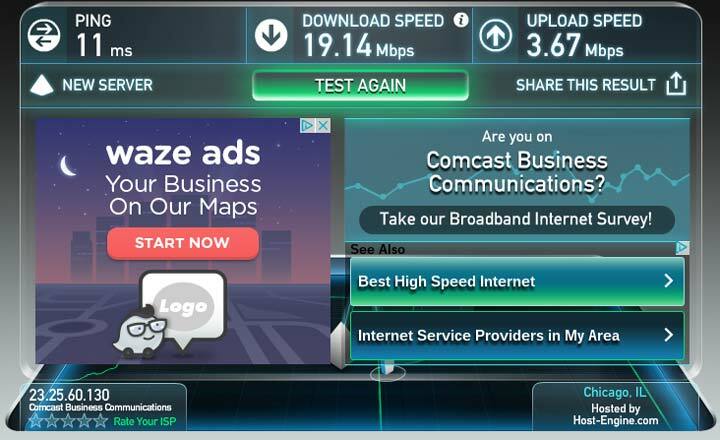 I tested 3 times and got 7 to 17 Mbps download and about 9 Mbps upload. I’ve never noticed a slow down at this location that disturbed my work. Noise here is the typical Starbucks hum. It may be a little bit louder because of the small size and the apparent lack of effort to add any sound deadening materials that you usually see in Starbucks locations. I’m going to use a sound meter app to measure sound at all locations I’m reviewing. 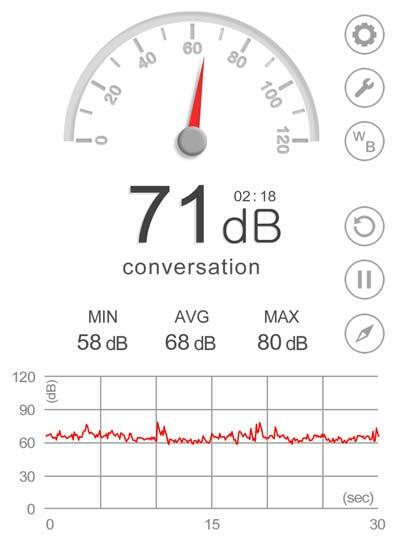 At Starbucks Roselle, sound ranged from 68-70 decibels (dB). You can make phone calls here but many people will not want to I’m sure depending on the noise. I’m going to try to rate locations on how “worker-friendly” they are. By this I mean how comfortable you might feel working here for a couple hours at a time. Some places are busy enough that you may not be comfortable taking up a table. Or some places may have a layout or furniture that is just not conducive to sitting and working for long periods. It’s all subjective, but I’ll share my thoughts and the pictures of the locations so you can make your own judgments. Starbucks is always worker-friendly in my opinion so no issues here except for the noise. It’s obviously normal for people to sit and work for hours at a time and space and comfort is rarely an issue at Starbucks. This location is a bit small, so you may feel a bit cramped or close to the person next to you. -Could be a problem for those of you with larger personal space bubbles! All standard Starbucks menu and prices are the rule here so there’s no need to delve into Frappuccinos and Latte Macchiatos here. Check out the Starbucks Roselle page for menu, ordering, and hours and check Roselle Starbucks on Yelp for more reviews. Located in Springbrook Shopping center right by Caputo’s on Lake St in Bloomingdale, Crave Cafe is probably not a place many people think of as a Free Wifi spot in Bloomingdale, but it could be a hidden gem for people looking for a place to work out of the house and grab a solid meal and coffee. They’ve been around since 2014 and I visited for the first time around 10:30am on a Thursday and it was pretty quiet. I saw one couple sitting down for a meal and 6-7 people grabbing take out food while I was there. Crave Cafe is a clean and attractive place with a HUGE menu. The physical menu board would probably cover the entire square footage of their kitchen! I’m not sure if that’s a ratio you consider in the food business (menu square feet vs kitchen square feet), but you probably want your physical menu to be smaller than your kitchen. Having said that, their selection is pretty awesome for a small place so I’m not complaining. Most food items on the menu are $4-7. They don’t open until 10am so Crave Cafe isn’t an option for people wanting to get out and work at the break of dawn. There are about 15 tables (2 and 4 person) inside and 4-5 tables outside. After a bit of confusion over the WiFi password, I connected and ran a few speed tests. 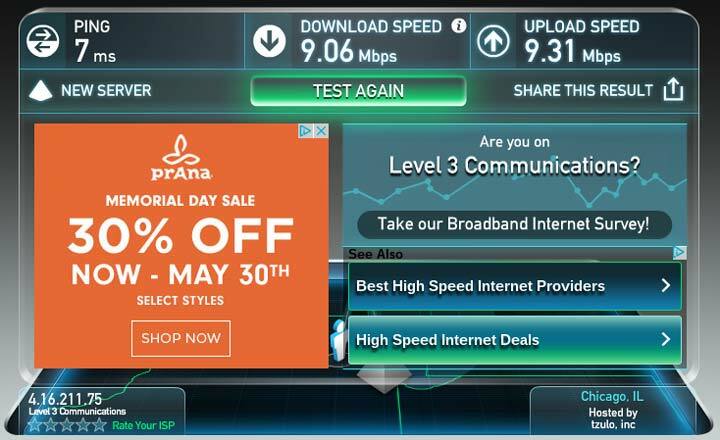 Speed averaged about 3 Mbps download and 0.90 Mbps upload. I was able to do some light work with no major lag in speed. I was the only one working there, and if there were ever more than 1 or 2 people on WiFi, the limited bandwidth would probably become an issue fast…or slow ;). There isn’t as much white conversation noise here as at Starbucks, but that made the music more noticeable and the sound meter measured around 66 dB on average. This was mostly sound from the music and not conversation like you’d get at a busier joint. Oh and one more thing on noise – the music was some classic rock/oldies station that some will love and some will find annoying since the music is more obvious in a quieter place like this. I was digging Journey in the background, but then What Kind of Man Would I Be? made me way too introspective to get any work done. I asked the owner there if people sit and work there much. She looked a bit concerned at my question and said people mostly come for food but people do occasionally sit and work for an hour or two. Since the tables were mostly open, I didn’t feel bad about spreading out at a 4 person table. But I probably would feel bad working long around lunch, dinner, or busier times. Mostly positive reviews on Yelp – check ‘em out here. This is a newer Starbucks location opening in the spring of 2016. It still had that new Starbucks smell when I visited. It’s larger than the Roselle Starbucks and has a variety of seating options which is great for people who are going to do some work. Being a new location, I was curious to see how fast the internet was. 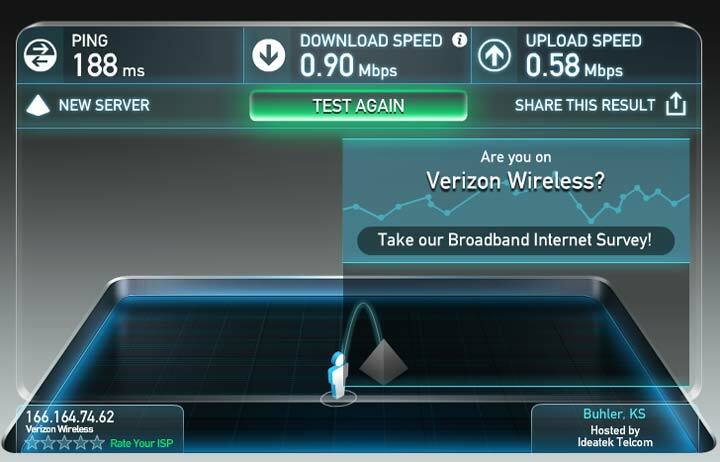 To my surprise, it was pretty pathetic barely scratching a 1.00 Mbps ceiling. 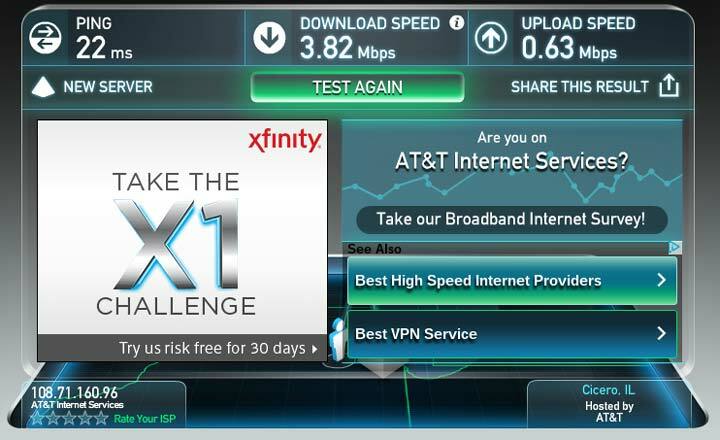 I thought that may have been a fluke so I tested it two more times and both times it was under 1.00 Mbps. Strange. Maybe they are still setting up their internet connection, but they had been open for over a month when I was there so I would’ve thought WiFi would be high priority at a new Starbucks location. So I worked for a while, but left earlier than planned because the connection was slow enough that it was actually irritating. We’ll give them a 2nd chance on the WiFi speed. If someone wants to do a speed test at SpeedTest.net and report your findings in the comments below, that would be awesome. I’ll check it out again in the future too because I find it hard to believe that it can remain this slow. Like I said below, this Starbucks has a lot of variety in their seating. They have 2 bar counters with 3-4 chairs each, three 4 person wooden tables, round high tables with 2 chairs, and a few comfy arm chairs. So you should be able to find a comfortable place to take a load off. 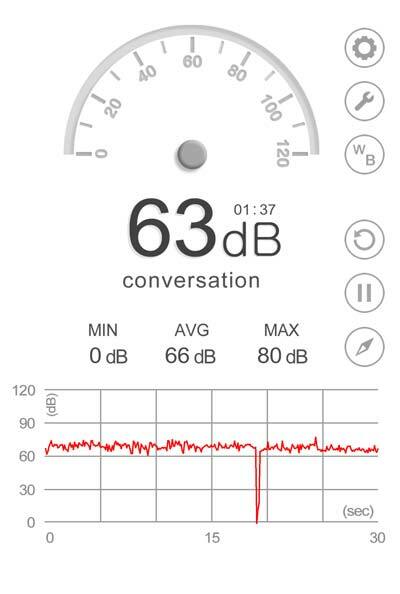 The noise level here averaged at 68 dB conversation levels which is similar to other Starbucks. Even though it’s bigger than the Roselle Starbucks, Glendale Heights is still tight enough that if someone is loud next to you, it may be tough to make an undisturbed phone call. Apart from the slow internet, this Starbucks is as worker-friendly as any other location. There’s no reason you couldn’t work here for a few hours. 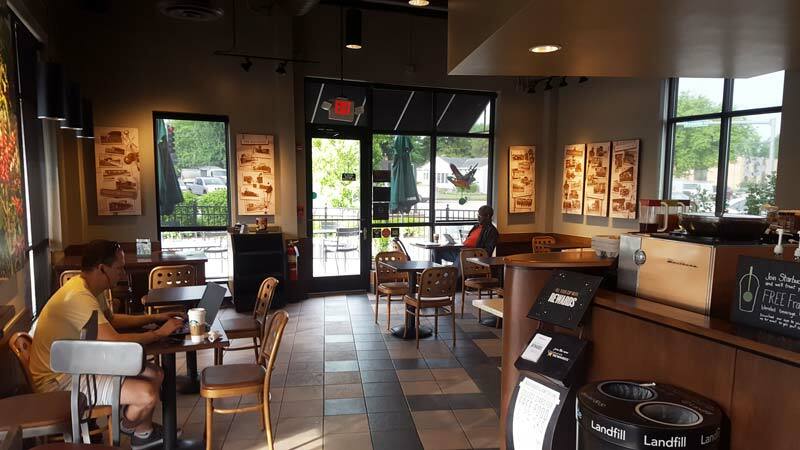 The Bloomingdale Panera is located in the Bloomingdale Square shopping center on Army Trail Rd. You’ve probably been to Panera before so you know the particulars about their food, pricing, and the look and layout of their restaurants. This Panera is active most of the day and super busy around lunch time which is when I was there to review it. There were too many tables to count at this location, but I would say there are more than 50 and most are 4 person tables. They have a few more comfy chairs by a fire and one larger table for groups. 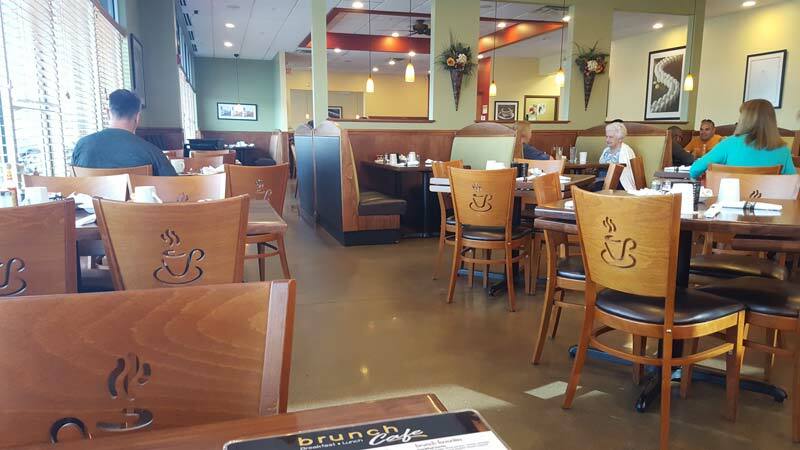 You shouldn’t have any trouble finding a seat here even at peak meal hours. There are some outside tables as well. There are some positives and negatives to Panera’s WiFi. First, it’s fast. When I tested it, it was near 60 Mbps. The downside is the system kicks you off every 30 minutes or so and you have to reconnect. Not a huge deal but worth mentioning. 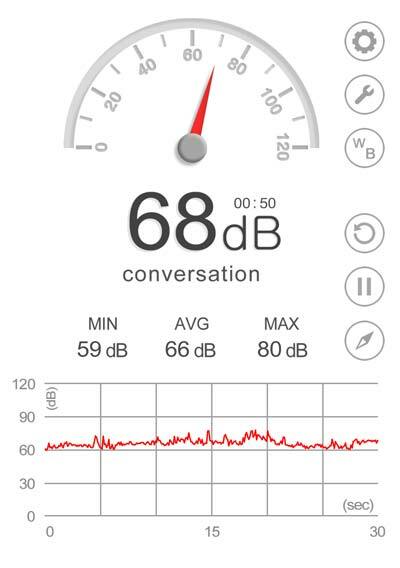 This Panera location registered at 65 dB average during the lunch hour. It’s a large location and the I’m guessing the biggest reason that it doesn’t seem loud may be that there are so many bodies in there around the lunch hour to absorb the sound. Even though there’s lots of noise, it’s not particularly bothersome because there’s so much noise that nothing is distinguishable. This contrasts with smaller Starbucks locations where there may be only 5-10 people talking and conversations are easy to hear and can be more distracting than the white noise of 50+ people talking at once. I haven’t found Panera to be as worker-friendly as Starbucks locations. When you logon to their WiFi, they give you a warning about using a table to work for long periods of time especially during busy meal hours. As I mentioned above, many Panera locations will kick you off the WiFi every 30 minutes or so. You can just reconnect, but it’s still pretty distracting if you’re sitting there for a few hours. 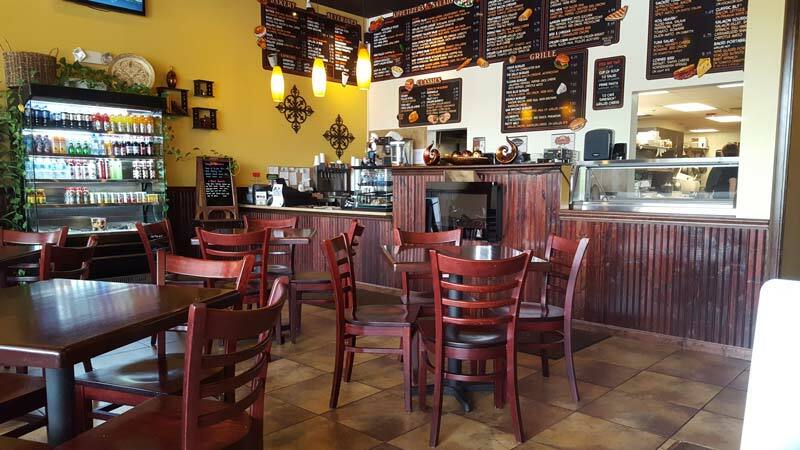 Brunch Cafe opened its Roselle location on Lake St and Gary Ave in early 2008. There was a hole in the community’s heart for a great breakfast place as evidenced by how well Brunch Cafe has done. They now have 3 other locations in the Chicago suburbs. This is not a typical work spot, but they do offer free WiFi so I figured I’d give it a test. It’s also a good excuse to grab an awesome meal there. Total Cost (coffee + breakfast): $16.50. Probably the most expensive place on this list. About 50 tables, mostly 4 person. 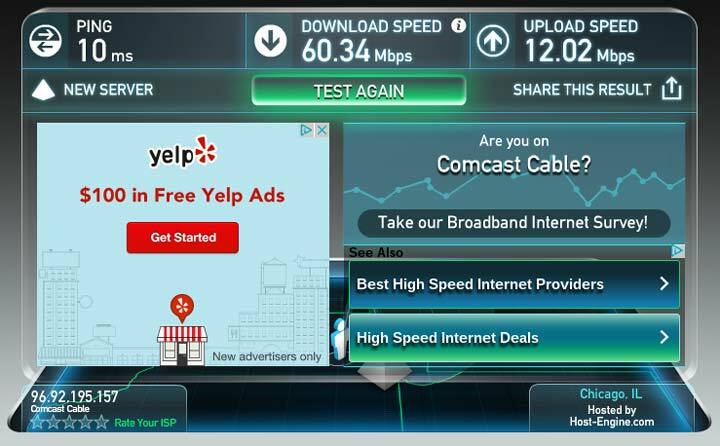 I wasn’t expecting much in terms of internet speeds at a restaurant like this, but I was pleasantly surprised. 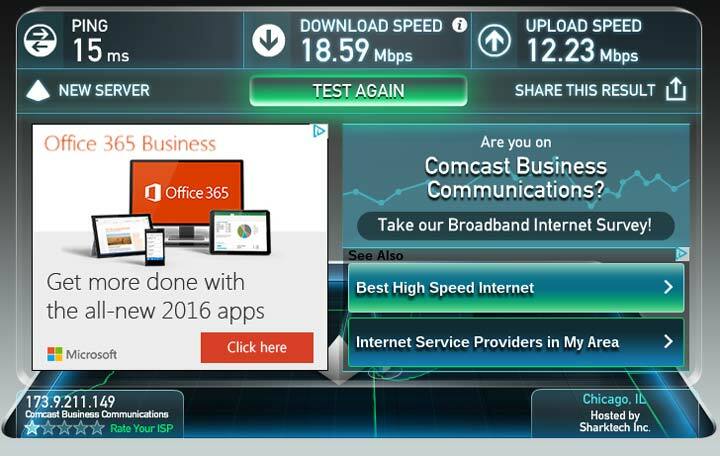 The internet speed test clocked in around 19 Mbps. With sufficient bandwidth like this, I didn’t notice any slow downs and the fact that I was probably the only one on a computer probably helped. 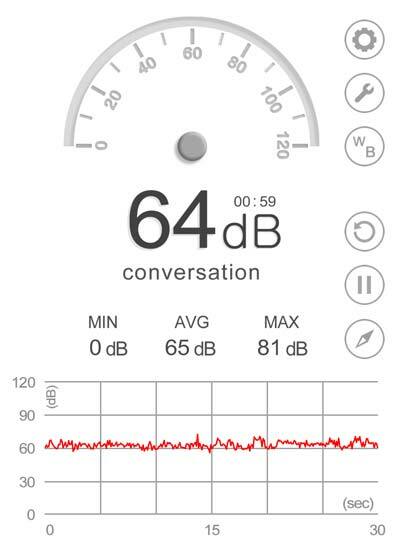 The noise level is normal restaurant murmur but it varies greatly throughout the day. It’s a pretty loud space overall since it’s mostly open with hard surfaces. Noise will depend on time of day and who is sitting near you. The noise level here is loud enough where most people wouldn’t want to make a work phone call, but it’s not the type of place to be making phone calls anyway. I ate here at 8:15am on a Friday morning in the summer. It was about 10% full when I arrived but was about 75% full by the time I left. It was enough to make me feel like I shouldn’t take up a table for too long to work. So Brunch is a good place to grab an awesome meal, but maybe not a place to work for more than 60 minutes at a time. Check out Brunch Cafe on Yelp! The library may not come to mind as a place to utilize free WiFi to get some work done, but why not? It’s the one place where the free WiFi doesn’t cost you a cup of coffee or a $12 “You Pick Two” from Panera. I hadn’t been in the Bloomingdale Library since high school and was pleasantly surprised by the interior. 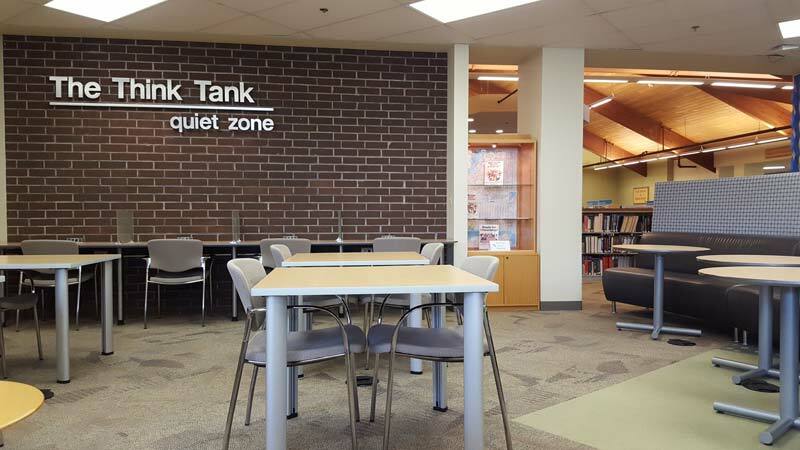 They have a few areas with long wooden tables and a small quiet work area called “The Think Tank” (pictured below). I chose this spot. It has seating for about 20 and some comfy chairs and couches with convenient work tables. This may be one of the most comfortable and ergonomic of all the free wifi spots I’m testing for this post. And let’s face it, comfort is pretty important when you’re hunkering down to get some serious work done. 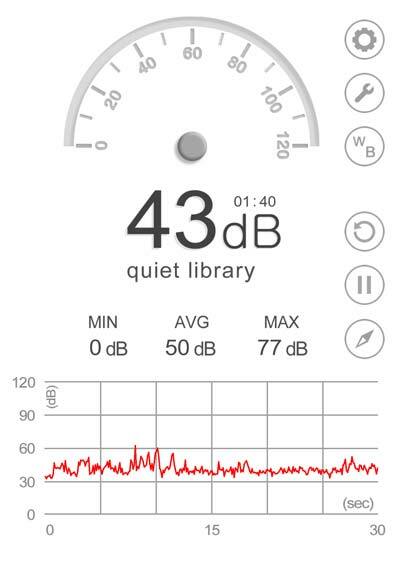 If the decibel level of the “quiet zone” isn’t low enough for you, there’s also a quiet study room and a meeting/conference room where I saw two guys working. That conference room had a schedule on it and looked like it could be reserved. 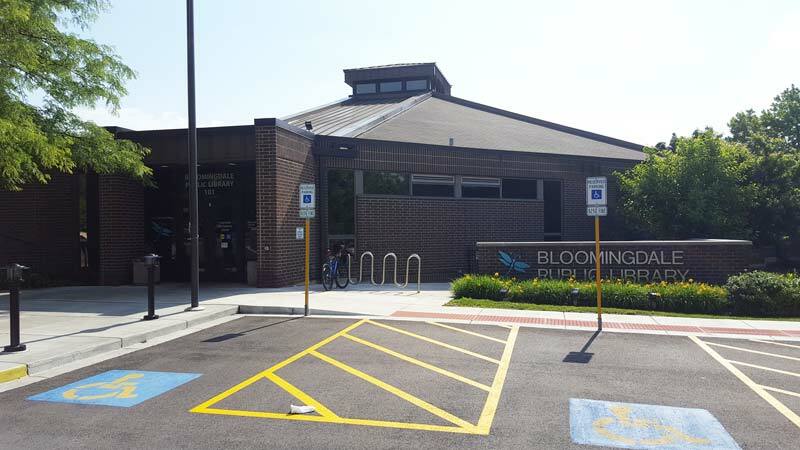 There are other meeting rooms at the Bloomingdale Library on the lower level that can accommodate 25-80 people and do require a fee to reserve. I was able to connect to the free WiFi no problem and the speed was more than sufficient as you can see below. It’s a library, so yeah – it was obviously quiet. It’s not a huge building and with the vaulted open space, the sound does travel. So I could hear the constant murmur of the librarians answering questions (usually a senior citizen asking how to use the “interwebs”). And the sound of a library staff member shelving books nearby was surprising calming. A lot of people who think they like background white noise to get work done may be surprised to find that the quiet is a welcomed change to the typical clamor we’re accustomed to. I had no issues walking in, finding a seat, and getting to work. I don’t think you need to be a resident or have a library membership to use the space. You probably won’t be able to make a phone call here unless the quiet study room or conference room is free. You may be able to find a nook in the corner where you can hide out and make a call without disturbing anyone. Get more information and current open hours at the library website. Is Free WiFi Really Free? We call it “Free WiFi” because these establishments aren’t charging us extra to utilize it. But it’s obviously a cost of doing business for them and we’re paying for it in the price of coffee and food. So it’s not really free unless you’re hanging out at the local library, and even then, the sticklers might bring up property taxes that we pay to fund the library operation. Bottom line – when using free WiFi, make sure to consider the real cost of using it which in most cases is the price you are paying to by food. If you’re going to Panera to work 3-4 times a week, you’ll probably be surprised at how much you’re spending per month on “free” WiFi! What Did I Miss? Agree OR Disagree? I’d love to hear your opinions on free Wifi locations in the Bloomingdale area. Did I miss any free WiFi spots? Do you agree or disagree with my reviews?